Last Updated: April 24, 2017. Thousands of Freelancers today are making 6 figure just from Fiverr as mentioned by Forbes about these three people. 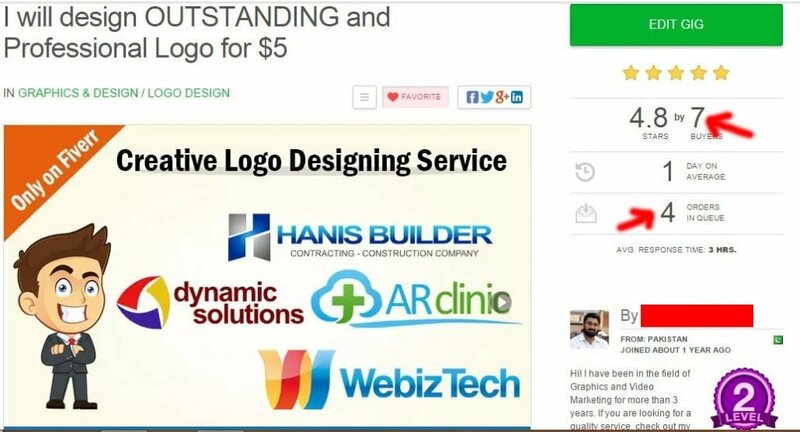 Everyone can make money on Fiverr if they have some skills. Fiverr has become a significant marketplace in the field of Freelancing since it was launched back on February 1, 2010, by Shai Wininger and Micha Kaufman. 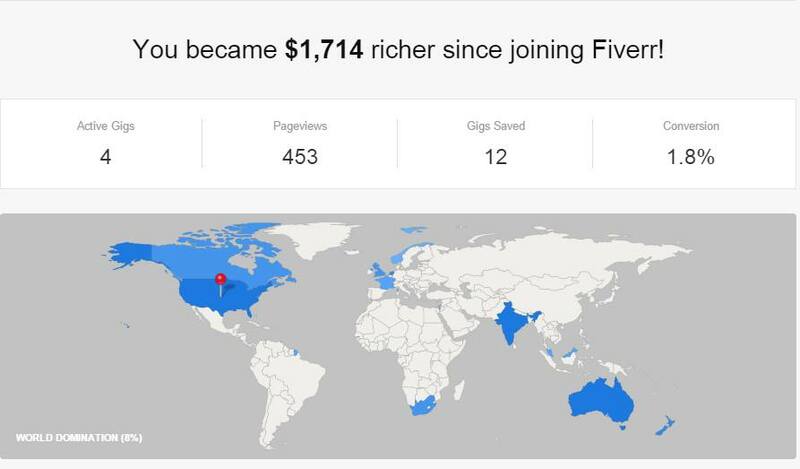 The earning came from just one single gig that I did for Fiverr case study. Want to know how I did it? Just read on. What You are Going to Learn? 3 Does It Have Such Potential? For just an overview, Fiverr is a freelancing platform that allows Sellers (freelancer) to sell digital services and Buyers to buy from them. Services offered on Fiverr are called “Gigs” which initially starts from $5 (Fiverr reserves 20% from it and pays you $4 for each gig sold). When I was looking for some Fiverr gigs to make quick money with Fiverr, I found one that was not only easy but also very interesting as there was a lot of potential according to the current market position where everyone looks to drive more leads and generate profits. It is evident that people are more likely to purchase the product after watching an amazing introductory or informative video about the product rather than reading a thousand of words guide. The same thing I was looking on Fiverr as what type of videos I could offer to my clients and I found that buyers were looking for Best Explainer Videos that could be more easy to conveyance their customers/readers to develop more interest to buy their offers/products. I did only 3 to 4 hours work a day maximum since it was enough to complete up to 10 orders per day. The Gig I selected was about creating a “Whiteboard Animation” using Sparkol. Does It Have Such Potential? Isn’t it amazing while spending 3 to 4 hours a day could easily make your $1k or $2k a month? 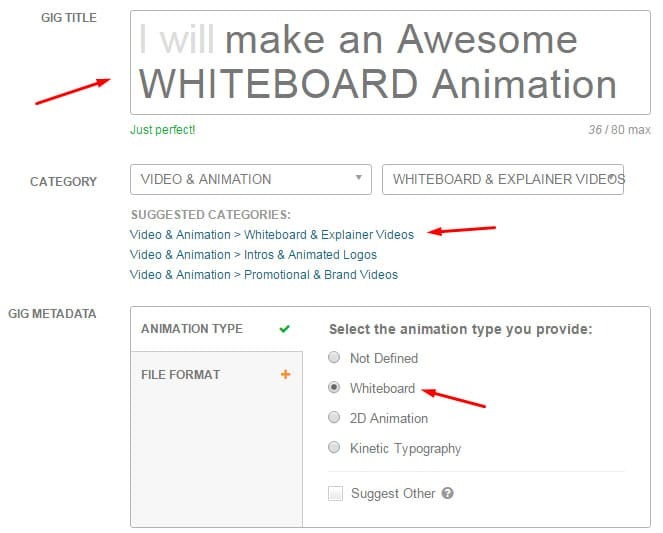 Because normally Whiteboard Animations are created for at least $50. Even I couldn’t spend much time experimenting this Gig while the other Freelancers are making more than me. Do check out some of the Gigs under Whiteboard & Explainer Videos categories to observe what others are making. Amazing results, right? But wait, if we just realize here, the second seller got 772 orders with an average per gig income of $4, and that would become about 772 x 4 = $3,088 right? But not all orders can be of $5 only. Here are some of my orders I got from Whiteboard Animation Gig from which I was able to make $5,643. $120 from a single order. And once again of $72. 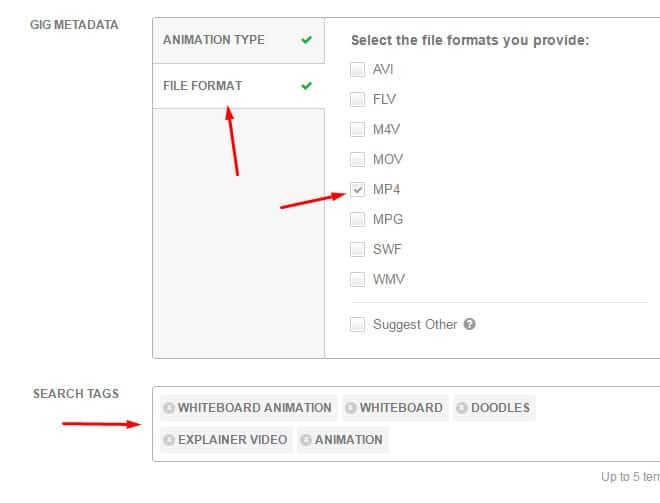 The list does not end here, but it continues, however, I was just sharing some of good and average orders details to let you analyze the potential of Whiteboard Animation Services on Fiverr. As you can see above, a single order of $90 and so on other orders, so if you just get one order, you can earn even more than $5 per gig. I hope you got the idea how this service is fantastic. It was also a great opportunity for me since making such videos is quite easy. These videos not only take minutes to be done but also are very simple, professional yet amazing. Alright, now you know the potential and have seen what amount we can earn and how smart it is to do quickly. Let’s have a look how you can easily create a whiteboard video that you can offer to your client. 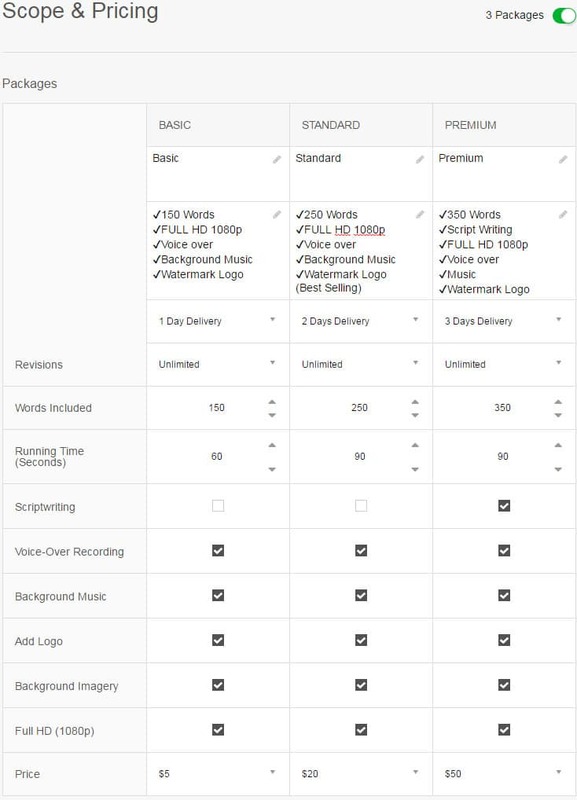 I am sharing some of the examples with you here so you can analyze what type of videos you can provide or how your buyers can demand from you. Another example you can check. Did you see how useful and appealing these videos are to make an attraction for the buyer? There is a tremendous potential for this gig not only on Fiverr but also on other platforms such as Upwork, People Per Hour and other freelancing platforms. Here comes the point, you know how these videos look like, the question is, how exactly you can make the same or more exciting and fantastic than these? 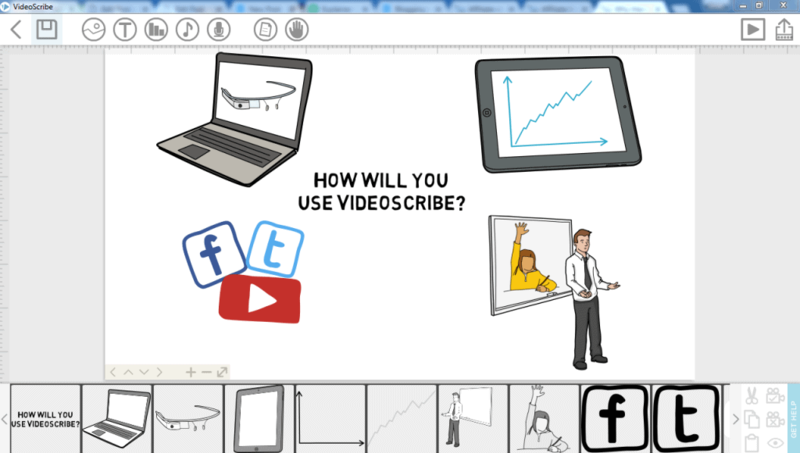 The Videoscribe makes it super easy to create stunning and outstanding whiteboard animation. Here you can watch complete training from Videoscribe Official website and it contains comprehensive training from basic to advanced. Believe me; it is very attractive and easy to understand. You know what, I even didn’t practice for it. I just launched the gig with my voice by creating my first scribe, and it was although amazing experience. Have a look at what I made for the first time. So far we have analyzed the potential, downloaded VideoScribe (Sparkol) and have done some practice. Let’s move on. There are few things you need to consider when joining and setting up the account. Considering them is important since you want better results and best effects on buyers. Here they are. Don’t create the profile using a proxy to show you as American or British. People do it to get good results, but it doesn’t make any sense, if you are good in service and provide your best, even an Asian can earn thousands. Don’t be late in completing orders. 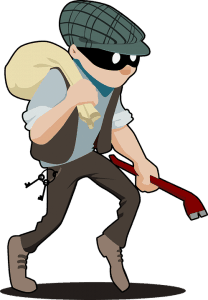 Don’t mention your email or provide any direct contact information. You will be banned forever. Don’t create multiple accounts. One is enough for a single person. Don’t create useless Gigs that you can’t do. Use your original name or niche related username. Upload a simple and smiling face profile picture. Give a brief introduction, who you are, and what you are offering. Give a story line tag under your name on the profile page. I will show how to do it. It is just a short line expressing your work. 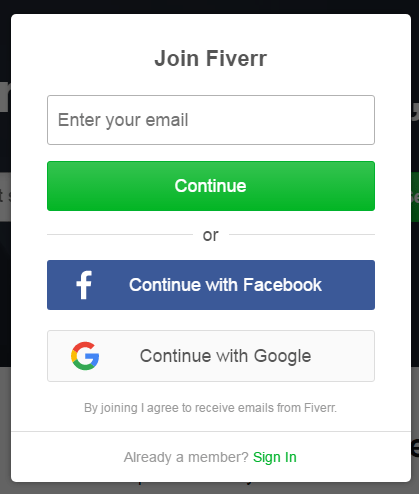 Open Fiverr.com and click on “Join” at the top right and enter your email and then give a username of your choice. Note: Don’t log in here with Facebook or Google Account. Because in this way, you will not be able to set your desired username. Check your email now and confirm your account. Once you have completed the joining process, click on “Start Selling” from the menu bar. In this way, you can provide additional information on the same page. Head over to bottom and find “Get Started” button. Set Your Account “Availability” here. Link your “Social Accounts” now. Upload a “Profile Picture” and put something about yourself in “Description” area. It’s the right time to create your very first Gig. I know you must be super excited at the moment. 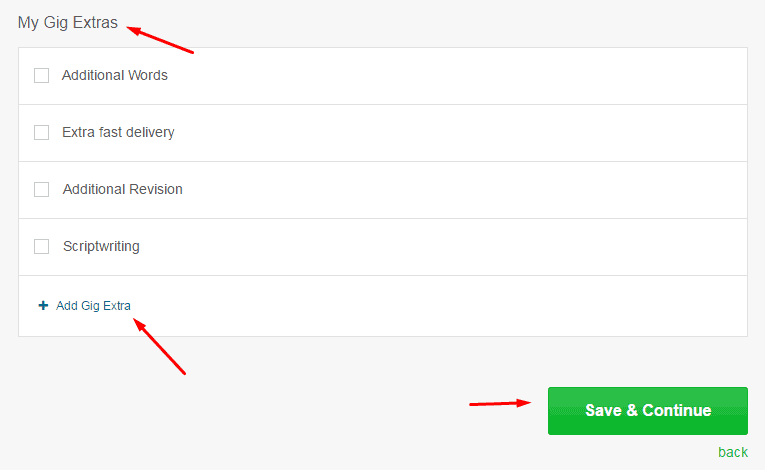 Here at this time, you should be giving your Title information, selecting the category and providing Gig Metadata. Here are some additional tips I want to highlight what I followed. Do some search and analyze what and how other top rated gigs/sellers are creating the title. Here are some quick tips that I extracted by observing some. In my case, I used the given below. Did you observe the word I used as capital? “Whiteboard,” exactly you need to do so since the buyer will search using this name and it will help you to get in higher position somehow. Select the file format you want to offer and put some tags as below. It is essential element while creating your gig and it will help in getting your gigs ranked higher in Fiver search results. What you need to do is to use the most appropriate and targeted words. You can also give attention to suggestion as shown in the picture below. In my case, I used these. While some other words include, “animation, 3d, doodles”. You can also use a combination of all these words. Instead of going into detail, check out the image below to get an idea as what pricing and services I offered. 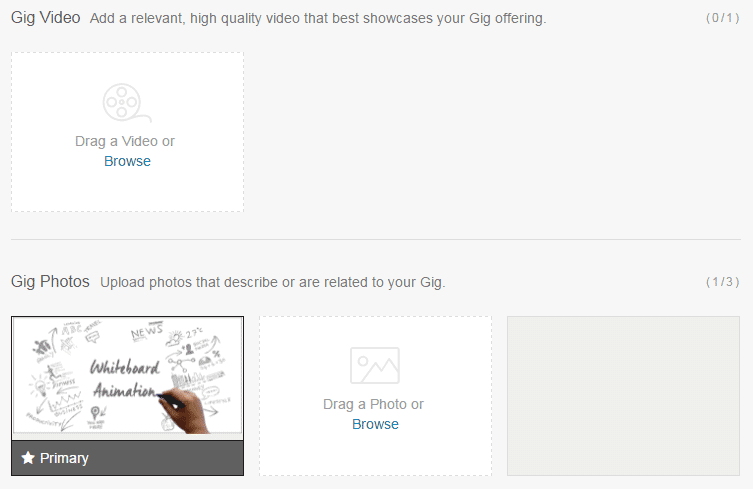 Here you can also setup Gig Extras. You can get some ideas with other sellers’ gigs description, but the one thing that you must focus is offering something unique and out of the box which means you must provide something extra to your buyer within the initial price. Like you can provide HD print of video for free, or quality images or whatever you want. In my case, I offered to some paid music that I bought from different resources. After the description, you must add your requirement as what information you need from your clients. If you observe gigs which are at the top, most of them have video as an introduction to their service. So always upload your own as well to get exposure and visibility. Also, it helps your buyers to understand your level of work and they are ready to order you more and more. Just remember to keep the quality of work as maximum as you can because one buyer can be a repeated client. I also earned about $1,000 just from one of my buyers, and he is continuously giving me orders on weekends. You have finally done it. You have an excellent title, awesome description and affordable pricing chart for our buyers. Let’s publish your first gig. Congratulations! You have now created your first Gig, and you are ready to make money on Fiverr. Although I have walked you through my descriptions and tags, you must know the essential elements of creating Fiverr gigs. This part is for creating and optimizing your service to represent it in the best way. 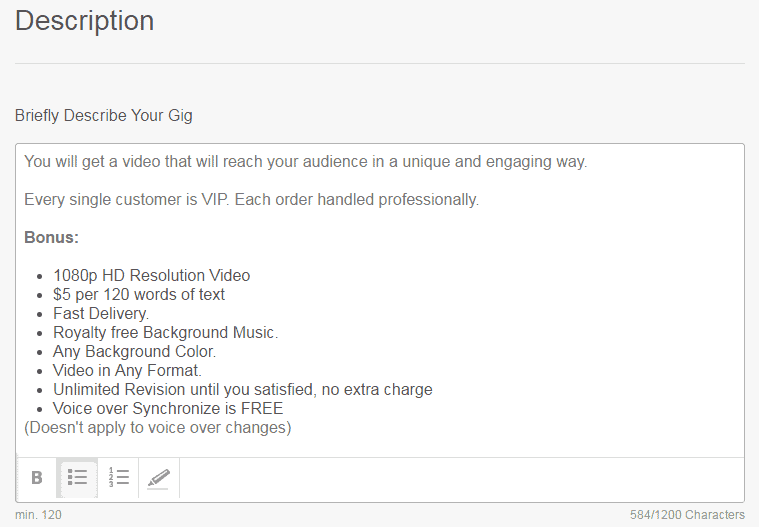 So here are some of the tips which you have to follow while creating gig. For Image: Always use a high-quality image that attracts buyers towards your services. Design it clean and superb expressing everything you want but must look professional. For Video: You must create a high-quality video representing what services you are offering in your gig. 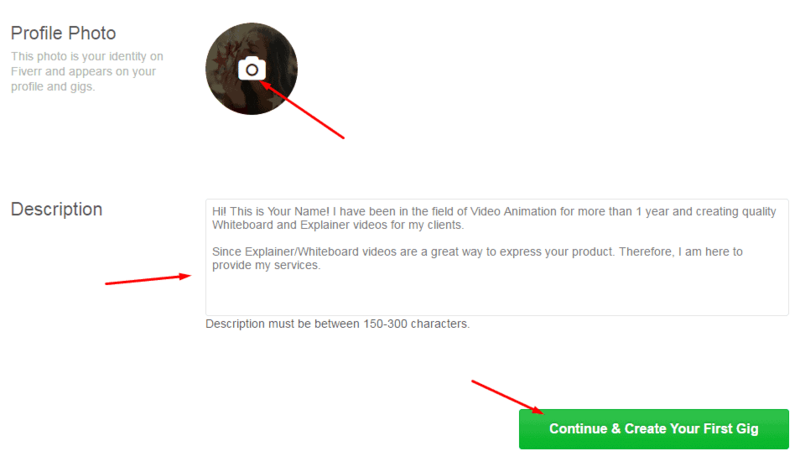 Remember: You have to use “Exclusively on Fiverr” written anywhere in the video or ideally at the end of the video. According to my point of view, it matters 80%. The more significant and comprehensive it will be, the more are the chances to get more customers. Alright, what you need to make it superb? At first, you have to write everything that you are offering. Secondly, describe why your service is unique and better than anyone else? Share some of your previous excellent experience. Now divide them into categories. What Will You Get in $5? These are the excellent convertible description which has worked very well in my case studies. Most people miss this part but believe me this is a major factor. Always chose the right keywords that fit to what you are providing. As I mentioned above, your tags should be a mixture of keywords what you are offering. Always chose the best time in which you can efficiently deliver your project. However I prefer to set for one day in earlier days and when you start getting back to back orders, just increase it. The most important and hot subject as of how you can grow and get fastest results. Thousands of sellers are offering more than 1 million services right now on Fiverr. How will you beat them and come up to make your standing among them? Here are some simple steps you need to do. Just search what you are offering, copy titles of first five gigs, write it and create a new one with a combination of these. You can also set the same title as one of your competitors is using. Create a better Image or Video than what your opponent is using; this will make you unique. There are many PSD files available on the Internet for your particular product you can use a good one. Or you can create yourself. It is one of most secret thing, just open the gigs of your competitor, check what keywords they are using, just copy and use them. You can find tags at the bottom of your competitor gig. Here comes the secret formula. After creating your gig, give some views by sharing through Social Media. Now when you have enough views something like 100+ and your gig is about 10 hours old, ask your friends or anyone to order your gig. No No! Not a fake order, but ask your friends if they need whiteboard videos or anyone in your social media circle. Then create the one for them and ask them to order your gig. But if there is no one interested in your friends’ list, then ask them just to order your gig and deliver a video in order, so it looks all real. You will only lose $1 for a single order when you deliberately ask someone to order, but you will get immediate rating and feedback which are most important for new gigs and fast ranking. In this way, you are not fooling anyone or the Fiverr system but this will help your gig stand out at the top among thousands of gigs. After all, Buyers will order when they see a previous positive rating on any gig. Alright! These are not just the ranking factors for any gig, do check my secret formula to Rank Fiverr gigs and you will understand the whole system of ranking. Well! 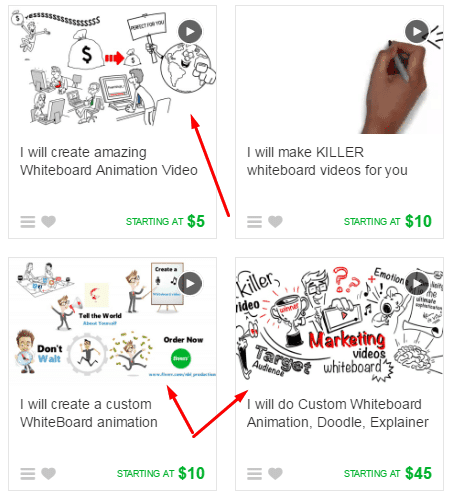 It is all about how to make money on Fiverr using my secret gig of Whiteboard Animation. Since this offer made me $5,643 from just one profile 😉 So I thought I must share the same with my readers. Step 1: Download Videoscribe (Sparkol) and do some practice from Official Tutorials. 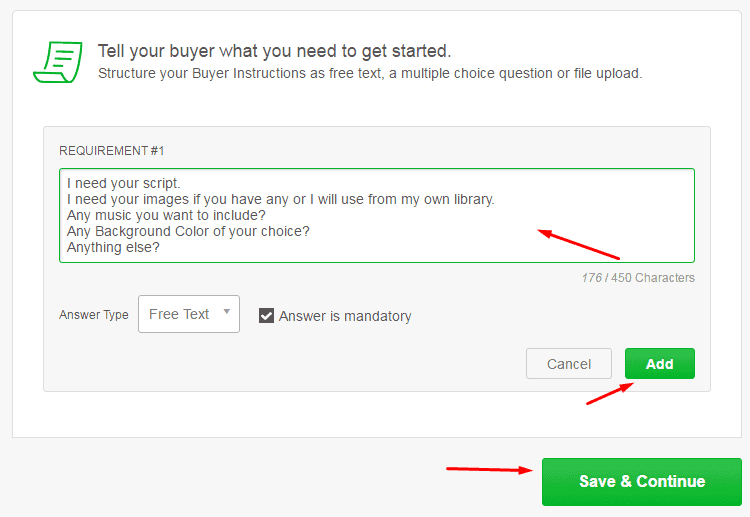 Step 2: Create Fiverr Profile and Setup Your First Gig. Check methods above. How simple is it right? Wait I have something interesting to show you as well. What if you are interested in Whiteboard animation? Or you might be from another field such as Web Developer or Graphics Designer or even SEO Specialist? The most important question of this post and you must be thinking about it now. So, let’s understand it. What is the best thing you can do? Such as Logo, Cover, Flyer, Banners, Mockups, etc, or Programming? Such as Web Development, Software development, WordPress Development, Web Designing, CSS fixing, etc. There are many things, but you need to analyze what you can do best. Then simply search the trends on the site to check if there is exposure in the service you are going to offer. However, there are some of the hot and tested Gigs of mine I would like to share here. The most amazing, simple and hot one you can try and offer. One of my friends made $12,000 within six months. I also tested it for three days and here is the response I got, and this is the just first day when I published my gig. I ended this gig in 3 days when I had made $150 with it. Check out one of my orders. You can also offer SEO Services likes, Link building, article submission, on-page analysis and much more. Just head over to the category and explore. Even I started my online career providing WordPress Solutions and fixes to clients. It has been my favorite service at all as I have made $1,714+ on one of my Fiverr profiles by just providing the small fixing solution. I even got three regular clients who still give me work like blog setup, website creation on WordPress, etc. Above are some of my tested services I have offered and experienced good exposure. You have to do a little bit more research about what hot things other sellers are offering. But wait, I have written an in-depth post covering most important and Best Fiverr Gigs ideas, do check it out. I hope you enjoyed reading out how you can make money on Fiverr quickly by just working a little bit on Fiverr and I hope everything is clear to you. Happy Earnings! Would you do a favor of just sharing it across all social networks? Thanks in advance. If you are facing any issues, do contact me and I will help you out. Stay blessed. For the whiteboard animation. Did you buy the monthly sibscription?